For printable directions using Google Maps, please click here. Take I-40 West to Conway. Take Exit 129 and then take Exit 129B. Curl around and go up & over I-40. Follow Dave Ward Drive (Highway 286) West 4.5 miles. Go to Donaghey Avenue; 5th stop light from Interstate. Turn right on Donaghey Avenue. (big UCA sign). Go 1/2 mile and turn left on Beatrice Powell Drive. Reynolds Performance Hall is on your left. Parking is free. Follow Highway 65 South into Conway. Go to first stop light past I-40 on Highway 65B. Turn right onto Donaghey Avenue at light. Follow Donaghey Avenue 4 miles to UCA Campus. Pass Bruce Street and Papa John’s Pizza. Go to fourth campus entrance past Bruce. Turn right on Beatrice Powell Drive. 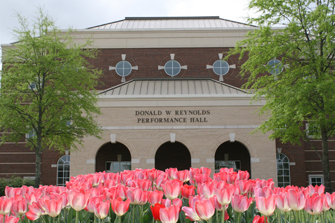 Go to Reynolds Performance Hall on your left. Parking is free. Take I-40 East to Conway. Veer right and go west on Dave Ward Drive 4.5 miles. Go to Donaghey Avenue, 5th stop light from Interstate. Turn right on Donaghey Avenue (big UCA sign).